It takes everyone’s help to build a great city. In February 2019, we’re taking time to thank our volunteers and residents for the great work they do, and showcase what it takes to build a city we love! Share a valentine with someone special. Sign up by Feb 15 and you’ll be entered to win a prize pack (76 KB). What kind of vehicles help build our city? See our trading cards with eight great members of our fleet. 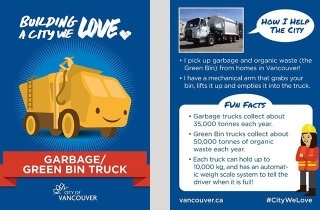 You can get the cards from staff working with these vehicles around the city! We’ll have quizzes and more from February 5 to 15! Take our quiz to see if you’re a trivia champ – and enter to win prizes!